A few weeks ago we received a very special book in the post. This book was written by a beautiful blogger friend Zanni Louise. You probably know Zanni from the blog My Little Sunshine House. I've been reading her blog for years now and I love it. So when Zanni put the call out for people to read and review her very first book, Too Busy Sleeping, I knew I had to get my hands on it. It's no secret that I'm a massive book worm, and I am trying my best to raise two little book worms. I truly believe their is no better gift you can give someone than a love of reading and if my girls grow up loving reading I know they will never be bored. Since before I had kids I collected kids books, especially picture books, and we have a rather large library of them now. 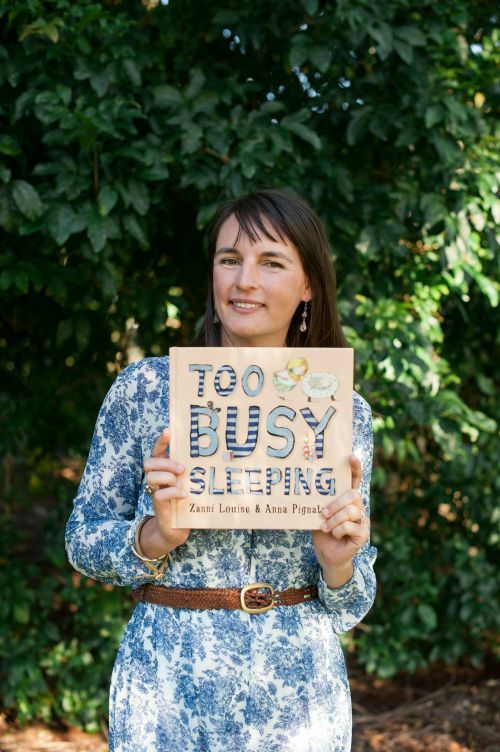 Despite this I am always on the look out for new additions, and I knew that Too Busy Sleeping would make a wonderful addition to our reading line-up. It's publication timing was perfect for us, with the arrival of the girls first cousin, Bear. While Zee is not so interested in Bear, Punky is beside herself with love and adoration for him. She asks me every day when we can see him again, and when we do she is so gentle and loving with him, marvelling over his cute little hands and feet. I tried to prepare her for Bear's arrival by making sure she understood that Bear wouldn't be doing much in the first few months of his life. That babies didn't do much but eat and sleep, and that she wouldn't be able to properly 'play' with him until he was older. Zanni Louise's book Too Busy Sleeping is all about the arrival of a new baby. Eleanor is excited for her new baby brother to arrive home, but her excitement is short-lived when she realises that Ruben is mostly too busy sleeping to be interesting. Throughout the book Eleanor asks if she can play with her brother but the answer is always the same, Ruben is too busy sleeping. Eventually though there comes a time in the evening when Ruben is wide awake and ready to play and Eleanor delights in tickling his tiny little baby toes and fingers, until she too is too busy sleeping to read her bedtime story. Zanni has captured those early days of life with a newborn from the perspective of an older sibling perfectly. The illustrations by Anna Pignatero are absolutely stunning and the girls and I love exploring the colours and textures of the pictures. Punky and I have pretty much read this book every day since it arrived. We sit on the lounge and talk about the story, how Eleanor is feeling, why she gets upset, and how cute baby Ruben is. We talk about how baby Ruben is like her cousin Bear and how she can't wait for him to get older so he can play with her and she can teach him "lots of great things!". 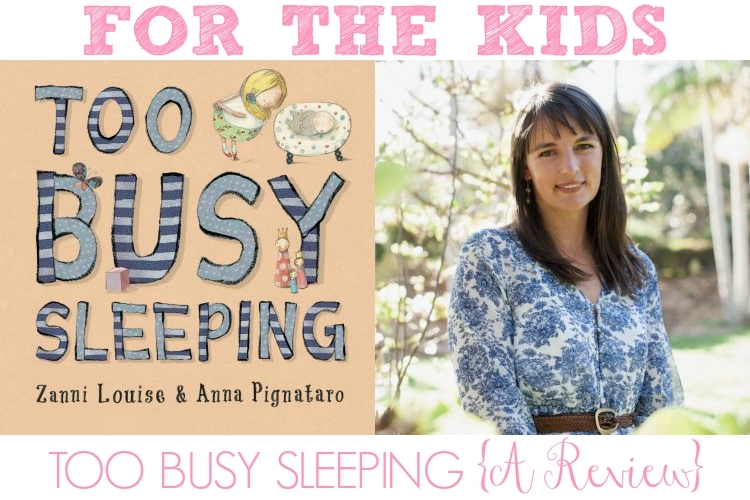 Too Busy Sleeping was exactly the book we needed to prepare Punky for the reality that is a newborn baby. Despite the fact it's not actually a newborn baby in our house, I know if we were ever to have another baby (unlikely!) that this book would be perfect to revisit, especially for Zee, to prepare for the baby's arrival. Even if you don't have a newborn baby in the family it's still a gorgeous book and one that I know most kids would love. It's the perfect bedtime book, the perfect anytime book actually, as books are definitely not restricted to pre-bedtime around here. I highly recommend putting Too Busy Sleeping on your birthday & Christmas shopping lists for the little people in your life. Did you read any special books to prepare your little ones for a new baby's arrival? What are your kids favourite bedtime books? Thanks to Zanni for sending me her beautiful book, we loved it! And linking up with Essentially Jess for IBOT to spread the word.